Louis Pasteur said that chance favors the prepared mind. 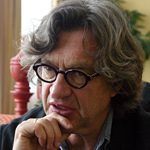 What’s true in science is true in art as well, if filmmaker Wim Wenders is any gauge. Whether it’s working with Bono, filming in Butte, or producing movies under a tight budget, Wenders prefers to leave room for the unexpected. After a marathon 90-minute Q&A the night before, the soft-spoken and thoughtful Wenders still had stories to tell about his newest film, Don’t Come Knocking, and about his career. Considering how many of these stories involved chance and serendipity, Wenders must have a very prepared mind. The German filmmaker, best known for Wings of Desire and Paris, Texas, finds one of the primary differences in European and American filmmaking in the handling of the screenplay itself. While Americans tend to view the screenplay as a blueprint to be strictly adhered to, Wenders is more comfortable with the German approach, wherein filmmaking itself is still regarded as a sort of adventure. That dichotomy ultimately led Wenders down the independent path. “I produced everything myself, after Hammett, which was the only time I was a hired hand. I realized my kind of movies—I could only keep making them, and I could only do what I was good at, if I just took it upon myself to produce them. And it’s a hassle sometimes and a waste of energy in many ways, but it’s the price you pay in order to do exactly what you want. Sam and I, we controlled this film 100%. There was nobody who ever interfered. By European standards, the $10 million budget for Don’t Come Knocking is at the upper reaches of the independent “low budget” movie, but still a long way off from the typical Hollywood production. And by Wenders’ own standards, the budget was a nice sum, having come fresh off directing Land of Plenty on a modest $500,000 budget. While working outside the main Hollywood system, Wenders still loves to make movies in – and about – America. It’s the American landscape that offers plenty of inspiration for Wenders and his work. Wenders’ first taste of apple pie was Paris, Texas, released in 1984. It was his first collaboration with playwright and actor Sam Shepard, and it earned him the Golden Palm at Cannes. Half a year later, Wenders had a treatment for a movie that sounded like a cross between About Schmidt and Broken Flowers. He showed it to Shepard who “shredded” it, but plucked out one of Wenders’ tangents and made it the focus a full-fledged screenplay. Wenders’ dissatisfied banker Howard was now a fading cowboy actor on the run from the prison of Hollywood. Music always plays a significant role in Wenders’ films and this time is no different, with T-Bone Burnett providing the score and U2’s Bono and The Edge providing the title song. That U2 connection goes way back, with the band providing songs for several of Wenders’ movies and Wenders directing some U2 videos. 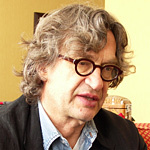 Wenders even directed Bono’s screenplay for The Million Dollar Hotel. The title song to Don’t Come Knocking is a duet between Bono and Andrea Corr (of the Irish group The Corrs) that accompanies the film’s end credits. But even getting that title song is another story of chance to add to Wenders’ history. Having seen a rough cut of the movie, Bono loved what he saw and volunteered to possibly write the title song. Undaunted, Wenders took Don’t Come Knocking to Cannes last year without the elusive title song, using instead one of T-Bone’s songs as a temporary track over the end credits. With release dates looming, Wenders finally had to draw a line in the sand and begin striking the film’s first prints for Germany and France, where the film was released late last summer. “So we told the lab, from next Monday on we’re going to make prints. Wenders then passed the e-mail attachment on to Burnett, who was in turn challenged with completing the song’s background track over the weekend. As nutty as the assignment may have been, Burnett was able to reassemble his band, record Edge’s arrangement, mix the track on Sunday, and Monday morning, when Wenders got back in the studio, he had the complete song. But the mere fact that the film was called “Don’t Come Knocking” is also a matter of chance. Watching the movie, you can see why Wenders might want to film on the Montana highways. Even the town of Butte is perfect for the story. Butte, like Howard, was once a Western star, and still plays one in the movies. But modern life sneaks in, and the old glory is mostly facade. The fanciest hotel in town has a rich, expensive, antique-looking lobby. But when Howard gets into his room, the “antique” looks so old you can almost smell the musty years. Another scene takes place on the old plank sidewalk in downtown Butte… right in front of the plate-glass windows of a gym, where health nuts doing cardio watch the unfolding drama with disinterest. Surrounding the town are buttes and bluffs, mountainous terrain with clean, clear air. As filmed by Wenders, you can almost feel the brisk high-altitude temperatures in the crisp blue skies. Key to capturing the small-town feel is the cinematography. Wenders takes credit for framing. “Since my first film the framing is mine.” But cinematographer Franz Lustig contributed as well. He has worked with Wenders for years, shooting mostly smaller projects, including Land of Plenty, which was a digital shoot. There was a scene with an unnatural-seeming change of light that was so jarring, it seemed like either a mistake by a rookie or a calculated, bold stroke by an artist. The scene in question is one in which Howard, standing in the wreckage of an emotional fight, watches his son storm off and out of frame. We stay on the figure of Howard as the entire scene darkens. “It’s not what you think,” says Wenders. “We shot this scene on a completely sunny day. Blue skies. Not a single cloud. And just at the moment that Earl is running out of the shot, out of nowhere this incredible shadow came down the street and threw a big shadow on Howard. It could not have been timed more perfectly. “We just stood there, our mouths open. We looked up and there was the tiniest little cloud, just one little thing, there was nothing else in the sky, and it had timed itself perfectly. It wasn’t Lustig’s inexperienced hand on the aperture, it was chance.